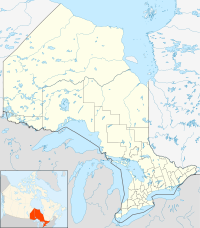 Thessalon First Nation is a Ojibwe First Nation in Algoma District, Ontario. Their reserve is located at Thessalon 12. They are a member of the Union of Ontario Indians. The traditional territory of Thessalon First Nation was established through extensive use and mutual recognition between Anishinaabe and communities of the area. This was recognized in the Vidal-Anderson Commission report of 1849. Thessalon First Nation's right to use the territory was recognized much earlier by the Crown in the Royal Proclamation of 1763, and in the Treaty of Niagara in 1764. The traditional territory reserved by Thessalon First Nation in the Lake Huron Treaty of 1850. ^ a b "Thessalon 12 census profile". 2011 Census of Population. Statistics Canada. Retrieved 24 June 2015. This page was last edited on 9 April 2019, at 18:20 (UTC).